Whether you are looking to decorate your four seasoned porch or living room, this high back chair will bring a refreshing look into your home. 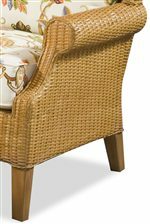 A wing back design, rolled arms, and tapered wood legs are enhance with a woven wicker design. With multiple fabric options available, create the perfect look for your home. The 1079 High Back Chair with Wicker Frame by Braxton Culler at AHFA in the area. Product availability may vary. Contact us for the most current availability on this product. Create a refreshing look in your home with the 1079 collection. Featuring a chair and ottoman, the woven wicker look offers a casual tropical appeal, while rolled arms, a wing back design and taper wood legs further add to charm. Whether you arrange this ensemble in your four seasoned porch or in your living room, this group welcomes a relaxed yet attractive style. The 1079 collection is a great option if you are looking for Tropical Tropical furniture in the area. Browse other items in the 1079 collection from AHFA in the area.